[Giveaway is now over - thank you for entering!] We are pretty ready to get sauced this holiday season...but perhaps not in the way that you are thinking of. 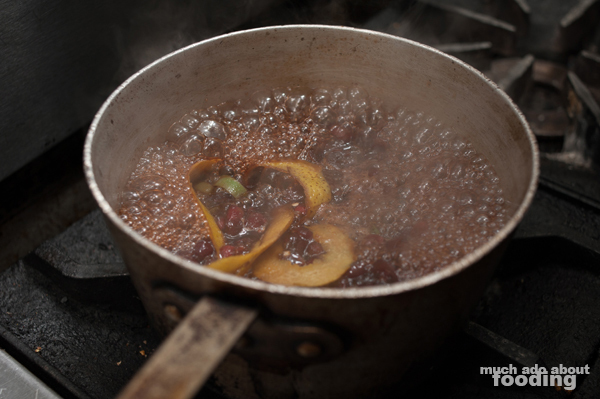 No, we've been thinking about how we spice up the holiday dishes that fill the days around Thanksgiving and Christmas. Accompaniments and flavor enhancers sometimes help make the sides and main course just a little more special, and what better way to spice up something than to really spice it up? Taco Asylum in Costa Mesa at The Camp has always taken pride in their hot sauces served on a regular basis with their tasty tacos but what you may not know is that they also have limited edition holiday hot sauces. These fruit-forward condiments vary from year to year so getting a taste of one in the season may be your only taste ever for that flavor. 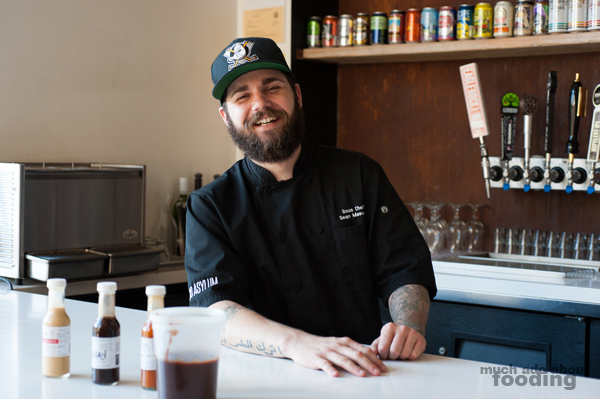 We really wanted to get involved in 2014's batch...really involved so we ended up helping Sous Chef Sean Masucci put together their newest: the Jaladay! To set things straight, I have never made hot sauce before in my life. It has always seemed intimidating and the fermentation process has made me wary. I have canned one thing in my life but have otherwise never preserved anything before. It seems like a difficult, careful process that I would someday pick up but I hadn't imagined doing so recently. The hot sauce idea was intriguing since the entire process was foreign to me but once Sean demonstrated each step, it did not seem so bad. For this particular hot sauce, he opted for a fruit-heavy one as he does with all holiday batches because it is meant to highlight the holiday dishes, not overwhelm and set one's tongue on fire. Luckily, the initial test run of the Jaladay proved to be good enough to remake. 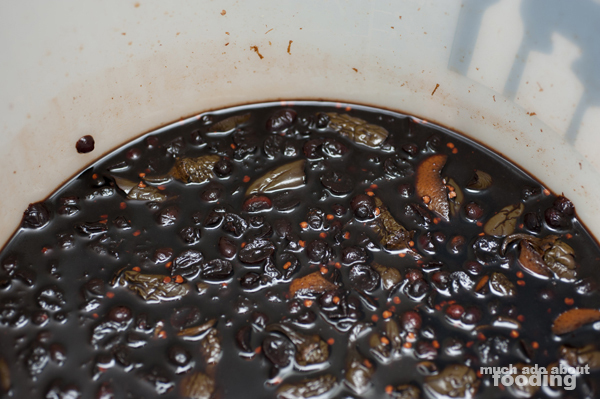 The basic components of Jaladay are balsamic vinegar, orange juice, orange zest (more flavor, less product), rehydrated cranberries, and sliced jalapeno peppers. This recipe would create a full-flavored, deep hot sauce that was predominantly fruity with some kick from the peppers. 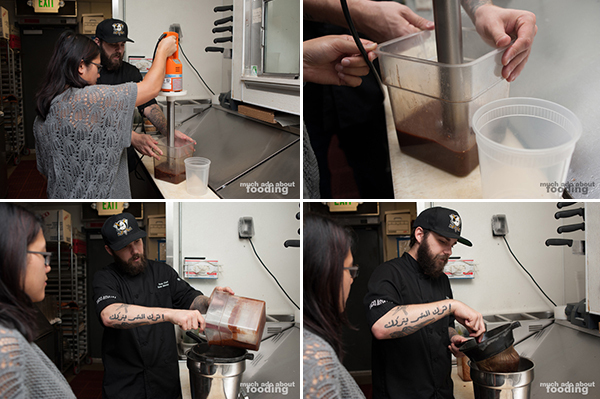 It also uses one of Sean's favorite components in hot sauces: balsamic vinegar - it helps with fermentation and is such a flavorful product in itself. We took equal parts jalapenos and cranberries (by volume, not weight) and mashed them with some orange juice to break up and release oils. Then balsamic vinegar was added and the batch was divided so that one could be made fresh for us to take home while the remainder would be left to ferment. The intended-fresh batch had additional water and vinegar added to it before it began to be worked on. 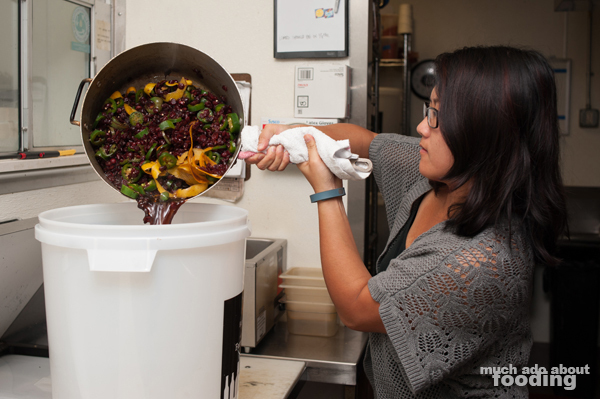 This was heated to Sean's tested ideal temperature to remove fermentable sugars and bacteria before being processed. Funnily enough, even this could have been too spicy for the sous chef when he first started working at Taco Asylum; he couldn't even handle the mildest sauce in store! Now, however, he's got 4-5 fermenting right at home including a type he is barrel-aging and another made with chocolate. 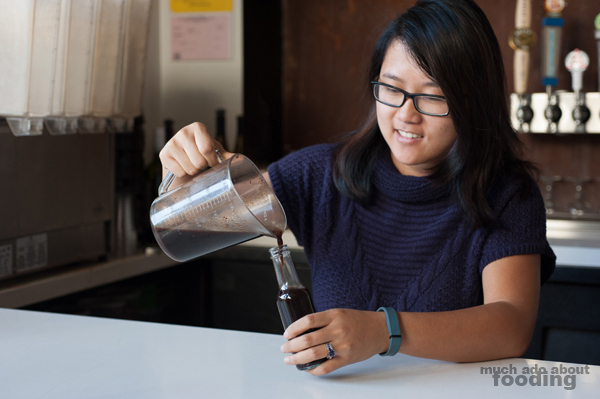 "If you don't bring it up to the right temperature after fermentation, it'll keep fermenting and become temperamental to heat so the bottle could explode." 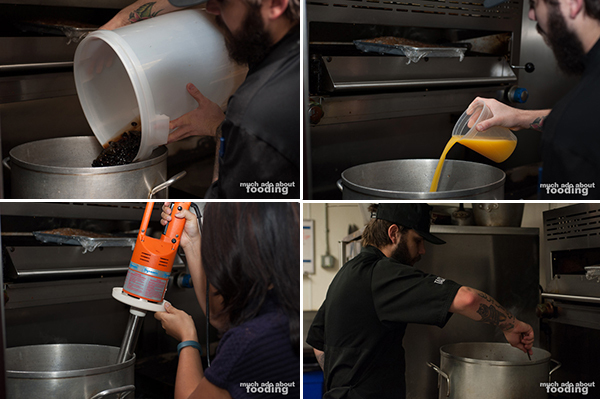 For the fresh hot sauce, we needed to bring it to a "raging boil" to kill all of the bacteria present. The one to be fermenting was, instead, cooked slowly. In both cases, the green in the jalapeno peppers was meant to be cooked out of them to ensure that excess sugars had been released. The orange pieces helped ferment the mixture because of its sugars, and because Sean doesn't add yeast, the combination used the natural yeast in the air for natural sugars. 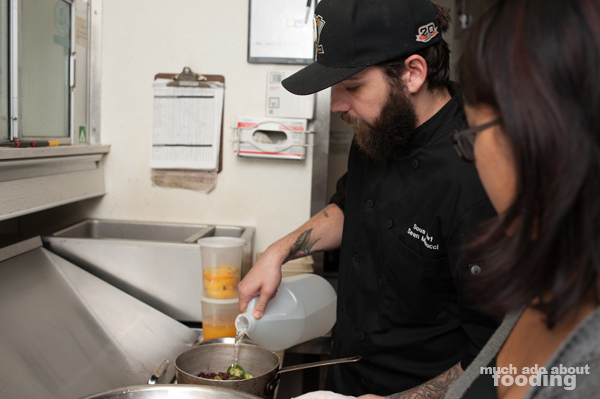 Because Sean enjoys fermented hot sauces, the one to be fermented was set to be aged 2-3 months. "Every year, I've done jalapenos for the hot sauce. 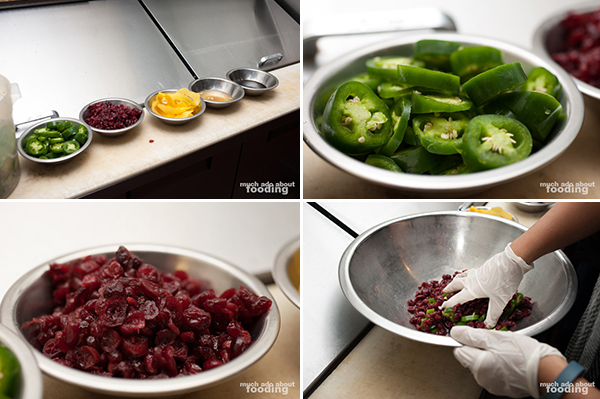 It goes really well with cranberries and it's something we put in everything here - jalapenos and Fresnos. It's not a direct heat like habanero but more mellow." So the fresh batch we were making was technically supposed to be our own, personal Much Ado About Fooding batch. I used an absurdly large immersion blender to work on the Jaladay which easily yielded under the appliance's power. Chef Sean claims that it is the best one he has ever made; the past ones have been the Jaladate (coriander and dates) and the Ho Ho Jaladay (cranberries, pineapples, peaches, coriander, etc). Xanthan gum was used during the mixing to give the sauce more thickness, and precaution is taken to ensure the sauces fermented perfectly whether it meant to give them more water or vinegar throughout the process. 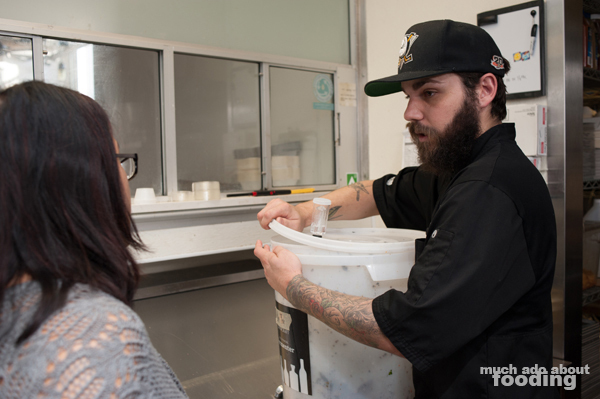 Chef Sean also mentioned about the presence of mold during fermentation, "As long as the mold is white, it's fine - if it turns black, you should throw it out." So who is Sean Masucci? He is a Cordon Bleu graduate who has been in the service industry for years. 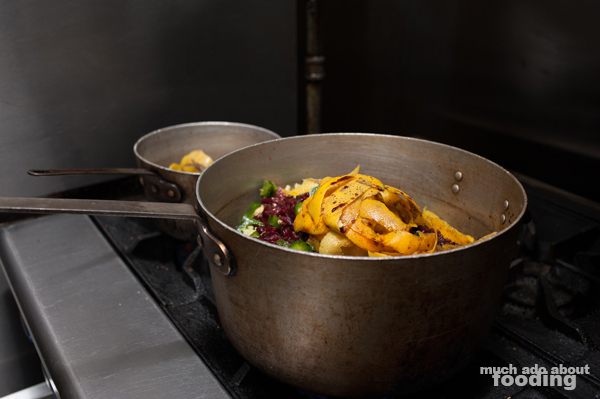 He has worked for the Patina Group, in corporate catering and even as a chef of Indian cuisine. During Black Friday, he will be offering 20 or so of his hot sauces at 50% off, a tradition for the restaurant that has carried throughout the years. You will be able to taste his prowess in this hot sauce realm if you snag several bottles yourself. You can also keep track of his creativity as more types are released such as his plans for beer-driven and beer-incorporated hot sauces. 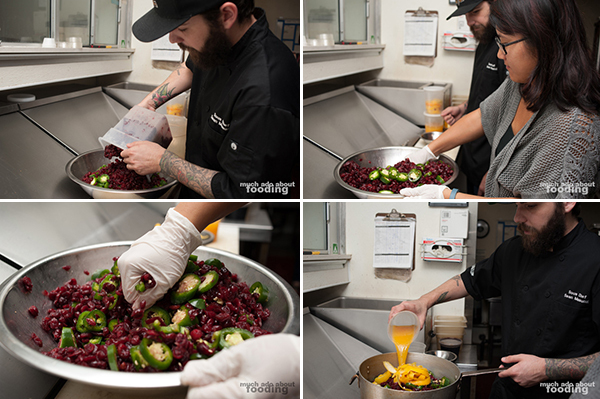 As Fresnos are his favorite peppers to work with, we're looking forward to those but more so, we are eagerly awaiting his "Veggie Box" hot sauce project! 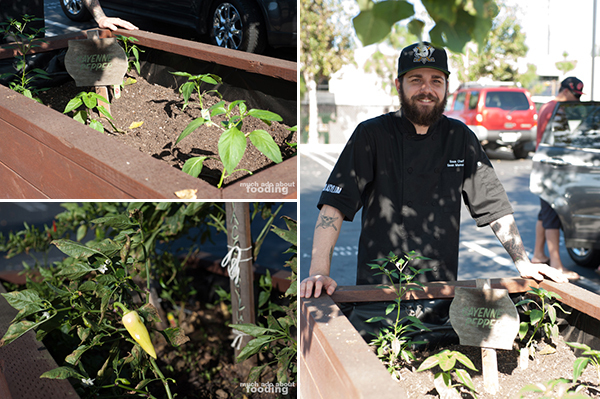 Interestingly, the frustrating parking lot of The Camp has dividers with grow boxes for the tenants of the center, and Chef Sean has taken to Taco Asylum's box to grow peppers! His pepper garden contains a large variety including cayenne, Fresno, Cajun Bell, New Mexico Big Jim, Anaheim, Habenero, and others. The plan for these babies is to eventually have a hot sauce blend made with all of the types so you can imagine why we're excited to see what comes out of that. With such varying levels of heat from the very different peppers (and how they'll influence each other growing together), the future hot sauce will be quite unique. What's the shelf life of your sauces? 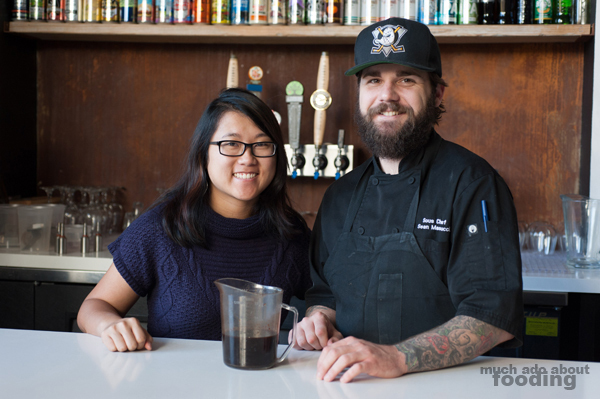 "Well, I have an original ghost chili and original honey habanero from a few years back. It all depends on temperature and bacteria - some have gone bad for customers already. Since we don't have commercial stabilizers and homogenizers, I don't know but as long as the vinegar lasts, it will last." Actually, before the straining, a last minute cinnamon stick was added to impart the barest of its flavor onto the sauce. After all, it is a holiday-themed sauce so why not have some of that familiar cheer in its personality? 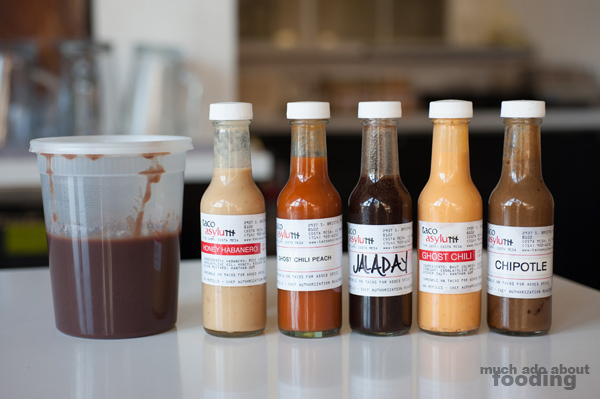 The Jaladay will release on Black Friday when they do their special 50% off of all hot sauces, a sale that results in them just about selling out of everything every year. To allow this limited edition concoction to grow in complexity and depth, it will be bottled just four days prior so it can sit and do its natural process thing. We're stoked ourselves with how it turned out - the sauce is definitely friendly to all types of palates when it comes to spice level because it is more focused on the fruit components than the jalapeno. 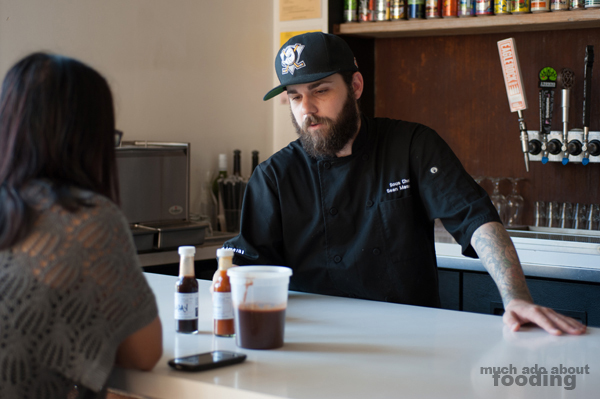 If you are eager to get your hands on the hot sauces that the talented and hot-sauce-excited Chef Sean puts together, there are several to think about this holiday season. In addition to the brilliant Jaladay we've had our hands in, you can get ahold of their regulars such as the Ghost Chili Peach, Honey Habanero, and Red Savina as well as the current special batches of the Carolina Reaper and Dry Hopped Red Savina! Keep that sale in mind on Black Friday while you're out shopping for holiday gifts OR enter our giveaway below to get some in your pockets. We've also heard a little rumor that their Thanksgiving taco special will be quite the treat, containing wicked good ingredients like chorizo cornbread stuffing, spicy cranberry chutney, beer-brined turkey (Raspberry Belgian), gravy, and crispy sweet potato fries...but we'll all have to see if that'll be the case! Our friends over at Taco Asylum want to share their fun with all of you as well and have offered a fantastic giveaway to readers of Much Ado About Fooding. Enter below before Thanksgiving for your chance to win a four-pack of hot sauces of your choice (one being the new, limited edition Jaladay) and become the envy of your friends. We have opportunities for two winners for this prize ($35 value each) and are super excited to hear your thoughts about the Jaladay. No wonder Chef Sean loves making this stuff - it feels like it's our own little pet project (even though we just blended and mashed)! Enter below and tell all your friends.